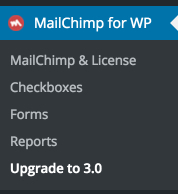 This morning, we pushed out updates allowing you to update to Mailchimp for WordPress version 3.0. This release includes a completely new form editor with syntax highlighting, better support for choice & address fields and way more powerful integrations with several other plugins. For a quick overview of the new features, please read through last weeks post where we showcase some of the new features. Another important change is that our Pro plugin is now called Mailchimp for WordPress Premium and is no longer a stand-alone plugin. Instead, it now adds the premium functionality to the free core plugin. Before installing the new version, please make sure to read through the upgrade guide. If you're currently using our Pro plugin, please install the update to version 2.7.26 and make sure your license is activated. You should then see a new menu item titled "Upgrade to 3.0" which will guide you in the update process. If you're a free user, a notice should show-up in your admin panel, asking you whether you would like to update. Because we really want you to try this new version, we decided to celebrate this release with a discount. Use the button below to get a 20% discount to purchase the Premium add-on (or to extend your current license with another year). The discount is valid this week only. We really hope you appreciate the effort we put into this update in the last few months. Please do not hesitate to let us know in case you run into anything during the update process. We're here to help, always.